Sunday December 1st 1907 It was a nice day. We went down home at 11.37. We had a quiet family dinner. It was too bad Fannie was not able to come up. Willie Anderson and [Milt?] & Mollie Moore called. I came home at 5.20 Will earlier. Talked all evening Ott is 48 years old today. Monday December 2 1907 I did some sweeping and extra home work in the forenoon Will helped me bring down the machine and I sewed some. Billy came back and Will hired him for this month. Tuesday December 3 1907 I was busy with the work all forenoon. I worked on the lace for the towel for the church fair and finished it. I read in the evening. A letter from Willie Laurence. 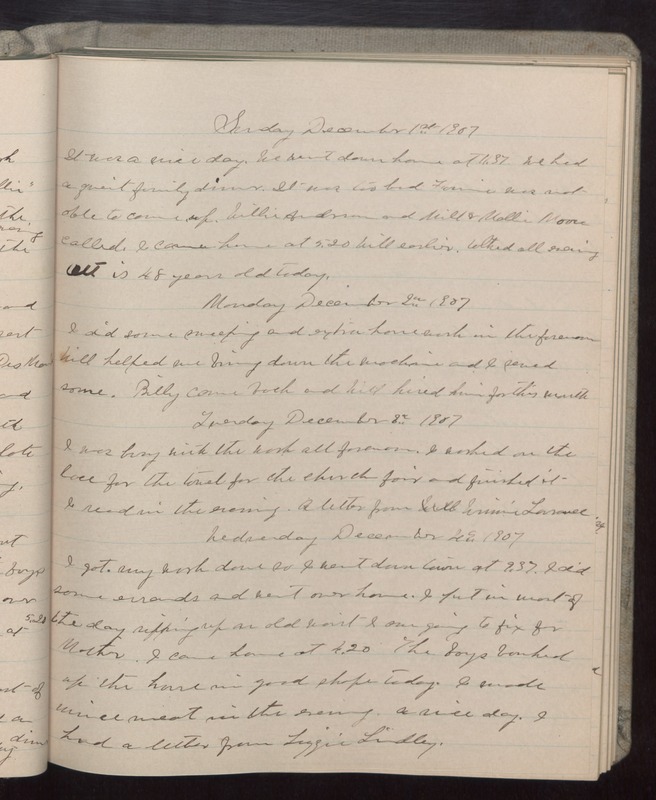 Wednesday December 4 1907 I got my work done so I went down town at 9.37. I did some errands and went over home. I put in most of the day ripping up an old waist I am going to fix for Mother. I came home at 4.20 The boys [banked?] up the house in good shape today. I made mincemeat in the evening. a nice day. I had a letter from Lizzie Lindley.